The Multilin 889 relay, a member of the Multilin 8 Series protective relay platform, has been designed for the protection, control, monitoring and management generators and in-zone transformers used in both industrial and utilities applications. 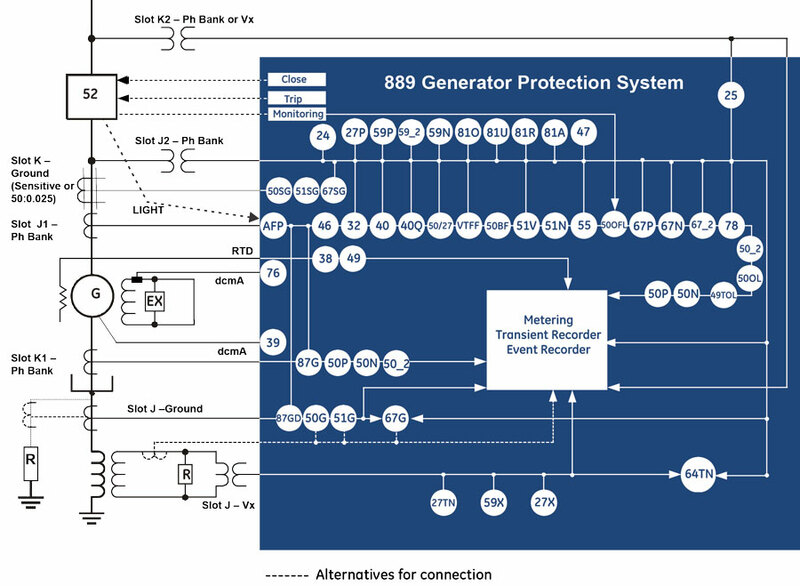 The Multilin 889 provides advanced, high-speed protection, extensively customizable programmable logic, and flexible configuration capabilities, to maximize the operational performance and life of critical generators. 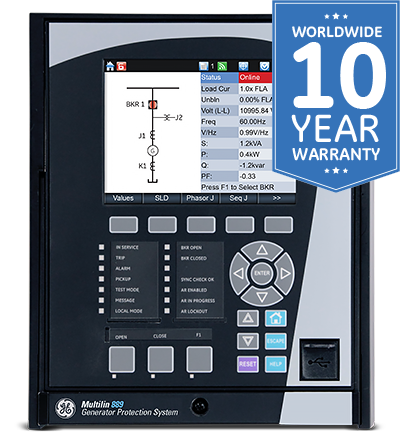 Equipped with the latest in advanced communications, the Multilin 8 Series supports IEC 61850 Edition 2 ensuring simplified device integration and dual communication ports with IEC 62439/PRP, enabling users to achieve zero latency in communications for high reliability network architectures, ensuring complete asset monitoring and control. The Multilin 8 Series provides a configurable dynamic SLD up to six (6) pages for comprehensive switchgear control of up to 3 breakers and 9 disconnect switches; including interlocks. Up to 15 digital and metering status elements can be configured per SLD page. The 889 has been designed for the protection, control, and management of generators and associated unit transformers in critical utility and industrial applications. The 889 utilizes high-speed dual slope differential protection for detecting and clearing of stator phase faults. Advanced CT saturation detection algorithms maintain immunity to saturation conditions that may be caused due to external disturbances through the use of a directional check that provides additional supervision and ensures the fault is internal to the generator before triggering it to trip. The 889 can provide overall generator and transformer differential protection (87O). It covers the protection zones from the generator neutral to the GSU (Generator Step-Up) transformer’s High Voltage (HV) winding. This additional protection element provides backup to both Generator Stator Differential (87G) and a dedicated transformer differential in a transformer relay (i.e. 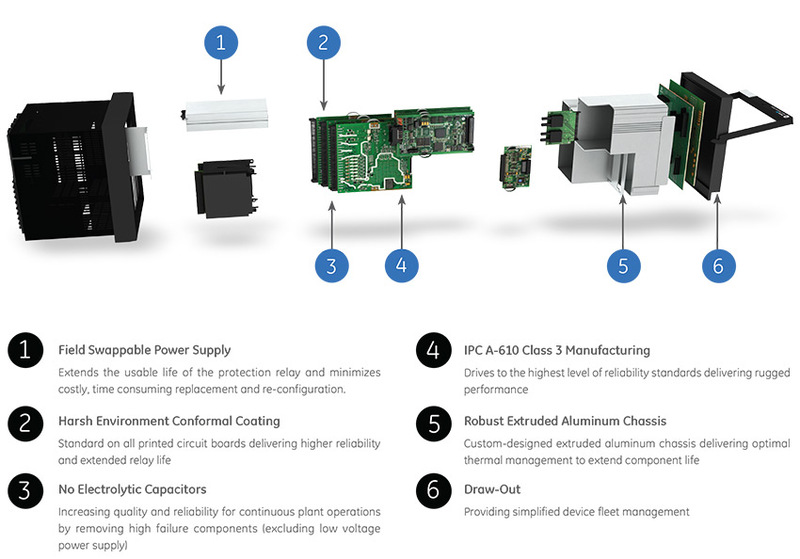 : Multilin 845 Transformer Protection System). The 889 with this Generator-Transformer Differential protection supports transformer setup, provides enhanced protection security by including both restrained and unrestrained (instantaneous) differential protection. 100% stator ground fault protection is provided through an overvoltage element and an adaptive voltage differential feature responding to the unbalance of the third harmonic at the machine terminals and at the neutral point. The 889 compares the machine neutral voltage and ground current to determine if ground directional faults are within or outside the generator. 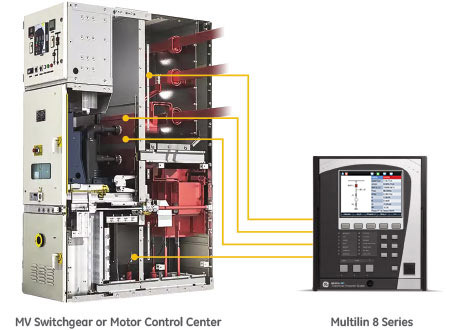 The Multilin 8 Series supports an integrated arc flash module providing constant monitoring of an arc flash condition within the switchgear, motor control control centers, or panelboards. With a 2ms protection pass, the 8 Series is able to detect light and overcurrent using 4 arc sensors connected to the 8 Series relay. In situations where an arc flash/fault does occur, the relay is able to quickly identify the fault and issue a trip command to the associated breaker thereby reducing the total incident energy and minimizing resulting equipment damage. Self-monitoring and diagnostics of the sensors ensures the health of the sensors as well as the full length fiber cables. LEDs on the front panel display of the 889 can be configured to indicate the health of the sensors and its connections to the relay. Fast, reliable arc flash protection with light-based arc flash sensors integrated within the Multilin 8 Series of protection & control devices. With arc flash detection in as fast as 2msec, the costs associated with equipment damage and unplanned downtime is significantly reduced. 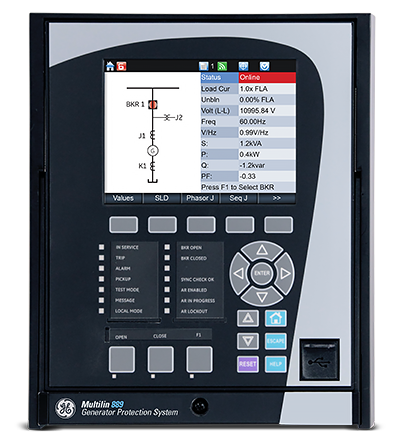 The Multilin 889 includes high accuracy metering and recording for all AC signals. Voltage, current, and power metering are built into the relay as a standard feature. Current and voltage parameters are available as total RMS magnitude, and as fundamental frequency magnitude and angle. 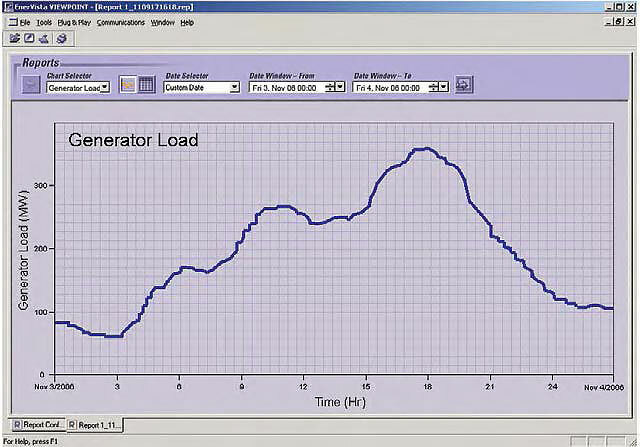 Log generator operating parameters to allow for analyzing generator loading and performance over weeks and months. Running Hours - The 889 can calculate/accumulate generator running hours, which may be of interest for periodic maintenance. if total running hours exceed the use-setting limit, the function would alarm the condition. The 889 can calculate/accumulate generator running hours, which may be of interest for periodic maintenance. if total running hours exceed the use-setting limit, the function would alarm the condition. Data logger, Oscillography, Event Recorder. The Multilin 889 offers a comprehensive generator health report that provides an easy-to-read snapshot of a generator's health and operating condition. Based on graphical representation and trend values of the generator historical data, the 889 enables operators and asset managers to identify process issues and maintenance requirements before damage occurs and costly repairs are required. This element calculates an estimate of the per-phase wear on the breaker contacts by measuring and integrating the current squared passing through the breaker contacts as an arc. When the threshold is exceeded in any phase, the relay can set an output operand and set an alarm. The 889 implements a patented environmental monitoring system that measures and provides operating condition information. Reliable and secure operation of the 889 relay and other electronic devices in the vicinity may be affected by environmental factors. The 869 relay has been designed to meet or exceed all required industry standards. Some operating conditions may be beyond those standards and reduce total lifespan of the device. The 8 Series built-in environmental awareness feature (patent “Systems and methods for predicting maintenance of intelligent electronic devices”) collects the histograms of each operating condition from the point the device is put into service. 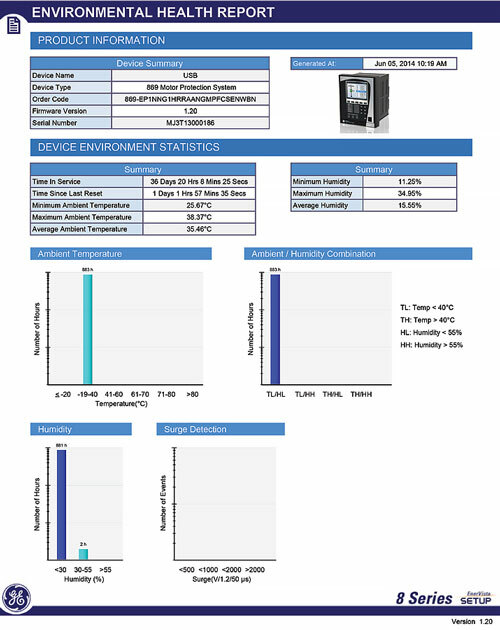 Monitored environmental conditions include temperature, humidity and transient voltage. These parameters are now available as Flexelement to output alarms in case of limits reached due to Temperature, humidity or surges. (Please confirm if this is the part to replace the existing part). The 889 provides advanced communications technologies for remote data and engineering access, making it easy and flexible to use and integrate into new and existing infrastructures. Direct support for fiber optic Ethernet provides high-bandwidth communications, allowing for low-latency controls and high-speed file transfers of relay fault and event record information. 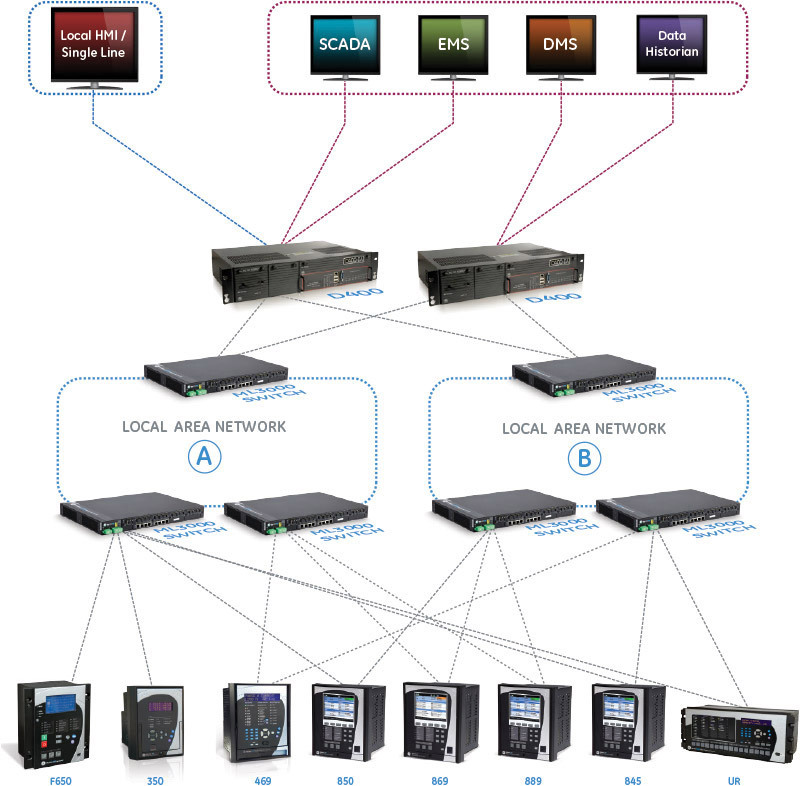 The 889 also supports two independent IP addresses, providing high flexibility for the most challenging of communication networks. 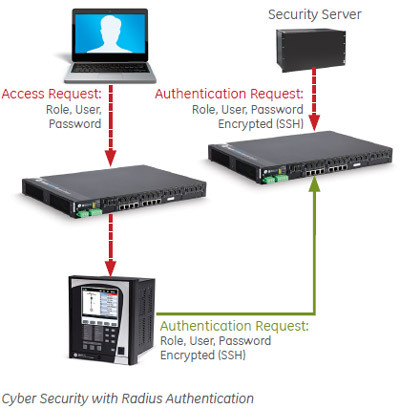 The 869 cyber security enables the device to deliver full cyber security features that help operators to comply with NERC CIP guidelines and regulations. Capture all cyber security related events within a SOE element (login, logout, invalid password attempts, remote/local access, user in session, settings change, FW update, etc), and then serve and classify data by security level using standard Syslog data format. This will enable integration with established SEM (Security Event Management) systems. The EnerVista™ suite is an industry-leading set of software programs that simplifies every aspect of using the Multilin 869. EnerVista provides all the tools to monitor the status of the protected asset, maintain the device and integrate the information measured by the Multilin 8 Series, into SCADA or DCS process control systems. The ability to easily view sequence of events is an integral part of the setup software, as postmortem event analysis is critical to proper system management. The setup tools within Launchpad allow for the configuration of devices in real-time, by communicating via serial, Ethernet or modem connections, or offline by creating device setting files to be sent to devices at a later time. 8 Series Setup Software is single setup and configuration tool across the platform and can reduce device setup and configuration time.